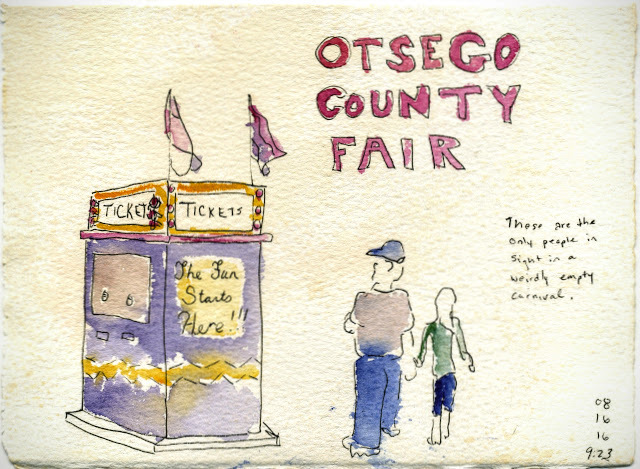 On the second day I returned to the Otsego County (Michigan) Fair to sketch, the weather had turned from hot and sunny to hot and pouring rain. I don't mind a little rain, but paper and watercolor paints, do... so I had to think strategically about what I'd draw. 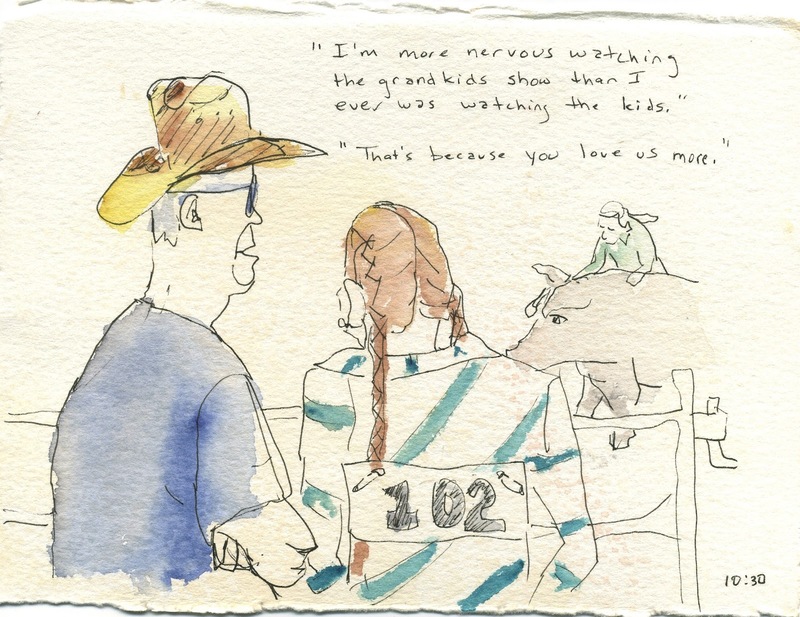 Especially because all of the large animal judging took place in an open air arena. No cover for the show or for the spectators. I tried, hovering over my book and paints with my hat and coat. 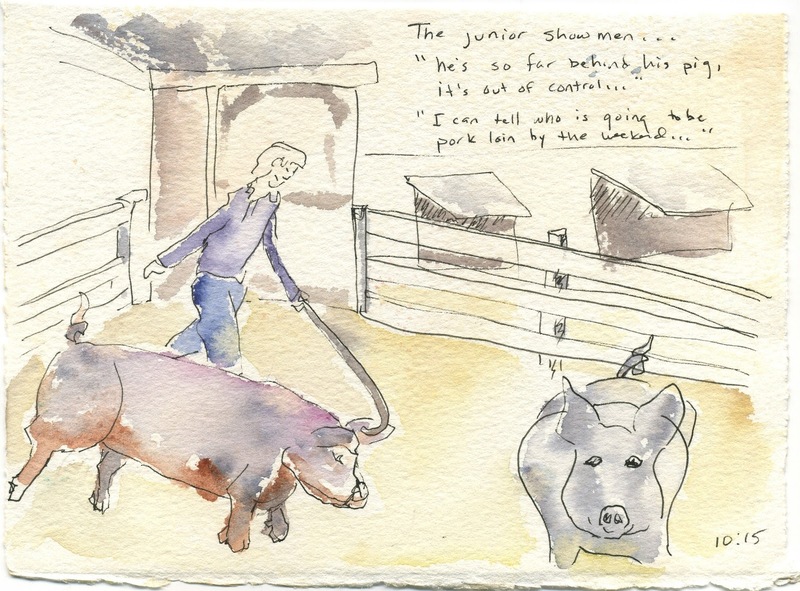 Then I decided there were enough interesting things to draw inside the animals barns. So I headed back to the big animal barn where I'd spent most of the day yesterday. Then I remembered that the poultry and small animal judging was happing in another barn, so I ran through the raindrops over there. It had been moved indoors! That made for lots of bustling activity among man and beast. 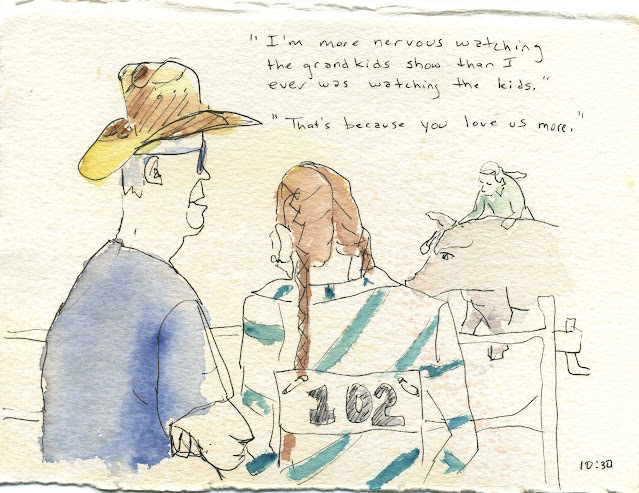 Because we were all smushed up into a fairly small building, I had lots of folks glance at my drawings, offering encouragement, wanting to chat. In particular, two nine year old girls offered to pose for me, and to introduce me to their animals. My young farmer helpers were ready to keep going, but after three plus hours of drawing, I had pooped out. Plus, my back had begun to hurt. This hadn't happened before, but I think it was from holding the paper close to my stomach, hunching over it, and keeping my elbows so tight because of the rain and the crowded barns. 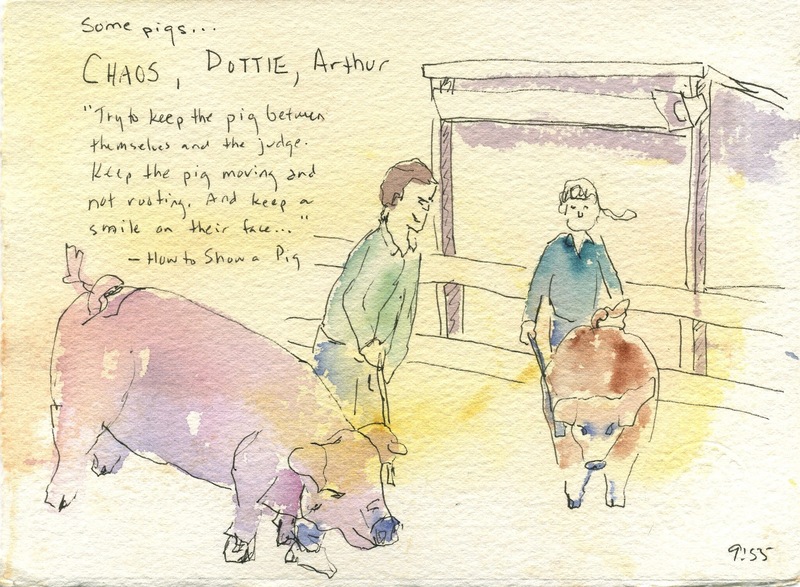 I had another great day drawing animals and learning from the people who raise them. After such a delightful experience sketching at the Ottawa County Fair in July, I headed up north (in Michigan) to sketch at the Otsego County Fair in early August. 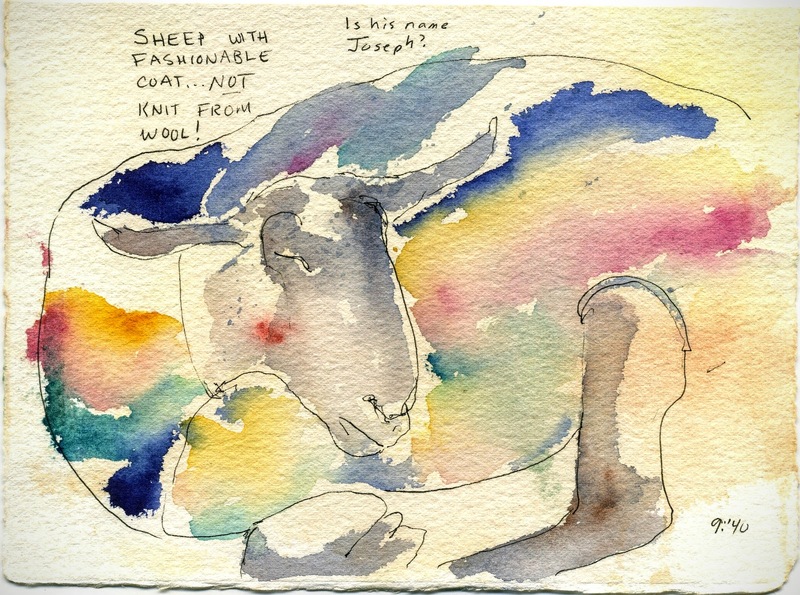 I took with me the same basic sketching kit: 5x7 journal cards made out of Strathmore Gemini 140 # watercolor paper pre-tinted with random splotches of quinacridone gold, two pens, a waterbrush, paper towel, and a Jack Richeson's child's palette box with eight Daniel Smith colors in it. 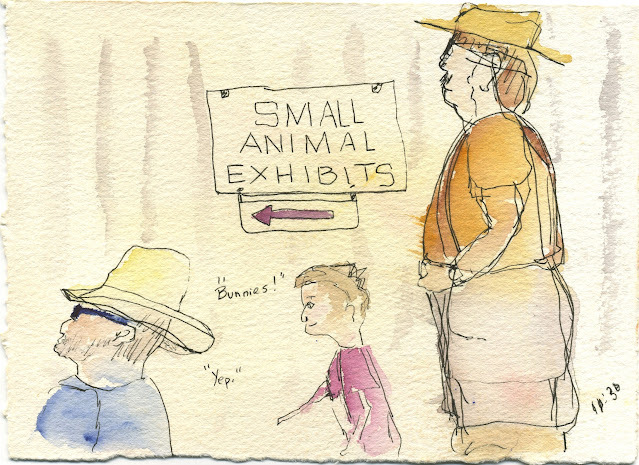 My plan was to sketch animals in context at the fair. I wanted to develop portraits and scenes. I also planned to talk to people, learn about what was going on, and capture dialogue in my notes when possible. I completed ten sketches in just a few hours. I think what I like most about sketching at the county fair is the respect everyone has for the animals. Families work together to take good care of them. Everyone from little kids through grandparents are happy to talk about the animals, taking care of them, showing them, and how all of that weaves through their lives. I know that many of these animals are headed to market. But still I am glad to see how much these people respect and care for the animals in their lives. As a result, I think, most of the animals are quite used to people and very few seemed skittish or out of sorts. Most seemed curious and interested in interacting with me--a complete stranger. 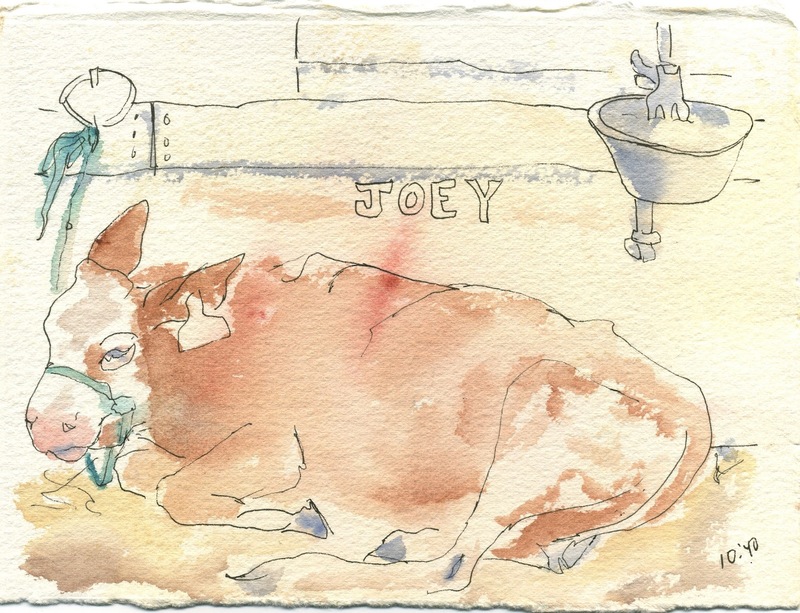 In addition to the scribbling itself, which always makes me feel connected to the world in which I live, I very much enjoy the sense of a connected web that runs through the animals, the people, the environment and their practices. Still traveling in Gaylord, Michigan, I returned to Call of the Wild, which I mentioned in a previous post, as one of my favorite places to sketch. 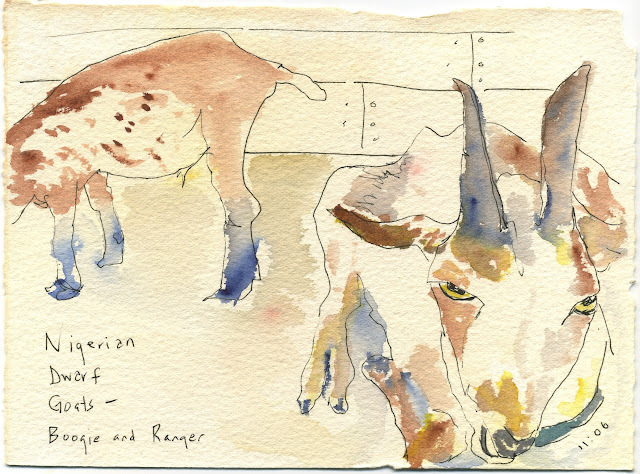 If you are ever in the vicinity and want to visit a nostalgic mom and pop place where you can sketch all kinds of taxidermied animals (plus eat fudge and buy cowboy boots), this is the place. 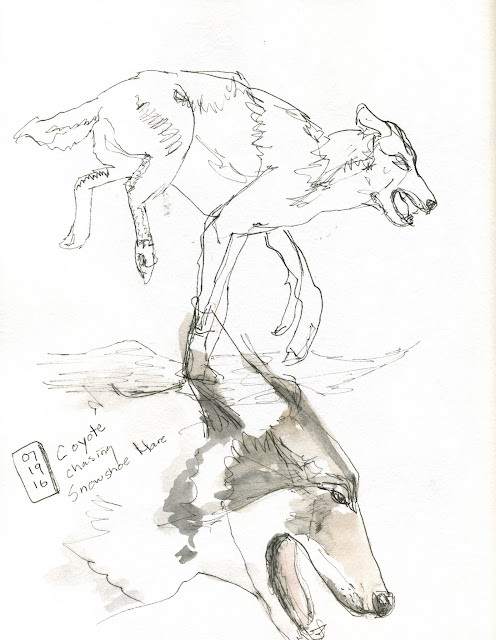 Anyhow, having worked on coyotes the day before, I decided to work on wolves in this scribbling session. In keeping with my July focus on watercolors, I used a waterbrush and a small palette of Schminke paints. However, I also allowed myself (for the first time in a while!) to use some ink. I wanted to see if I could use ink combined with watercolor in ways that were more than just a tinted ink drawing. 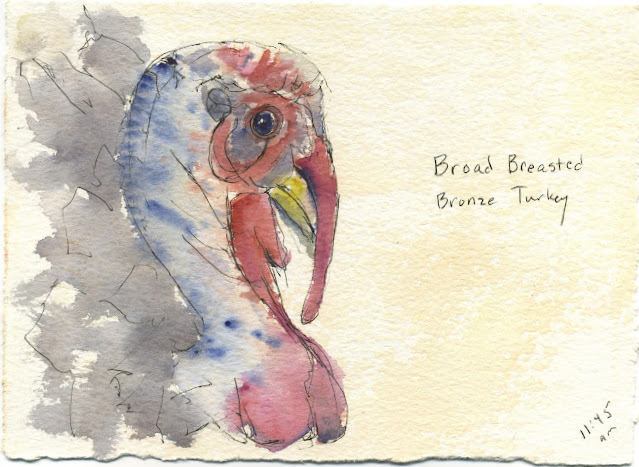 I focused on shapes and colors, and included some contours, but not as many as I would before I started this watercolor class. To begin, I chose what I thought would be a challenging angle. I surprised myself that this came out fairly well, especially for a first sketch of the day and of this model. Could be that my previous work with the coyotes helped, since the animals are so similar. Next, I tried a head-on view of a different model, wanting to practice a bit more with seeing the nose and rendering it in perspective. I also chose not to use ink in this one. Below is a clearer photo of the pages (done in a Strathmore 500 mixed media sketchbook). r, I can see grown in my use of the watercolor that pleases me. I can use both now in quick, scribbly ways, and get richer results! The daily practice is really paying off. Finally, I moved to a coyote model I hadn't seen the other day. I liked the running position and thought it would make good practice for capturing my own dogs in motion. First, I focused on capturing the whole animal's position. 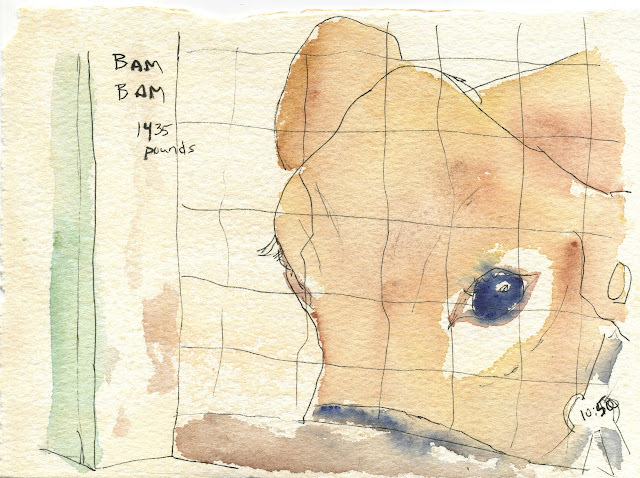 Then, in keeping with the other two sketches of the day, I did an detail of just the head and included watercolor. What a great sketching session! 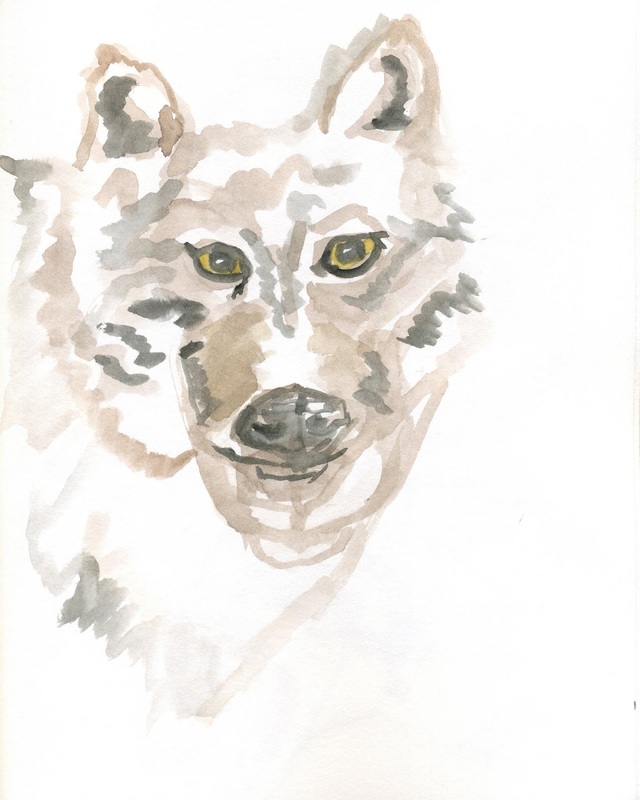 In and out in about an hour, paying focused attention to beautiful animals, and improving my creative skills. I can't imagine many better ways to spend my time! During my July focus on watercolor, I travelled to Gaylord, Michigan and got to sketch in one of my favorite places, The Call of the Wild. If you are ever heading north in Michigan on I-75 and want to draw taxidermied animals, this is the place to go! Also, and I mention this because you won't really see it in the photos below, this is an old-fashioned 1960s style attraction. Small and friendly. A terrific gift shop with something for everyone. Kind of cheesy, super fun. And bonus: all of the backdrops to the taxidermy exhibits were hand-painted decades ago by members of the family. Truly a cool place to visit. Anyhow, for this particular scribbling session I wanted to focus on coyotes because I want to get better at drawing my dogs, and they are only still enough for me to draw when they sleep! I thought this could help me learn basic canine shapes in some different positions. The first coyote I chose was positioned in a snarl. That seemed like a fun challenge. I began sketching and though I was using watercolor paints, on auto pilot, I went in as if with a pen, drawing lines. I struggled to capture the snarl, the curve of the flesh around the nose, the twist of the tongue. So I decided to focus on negative space and bigger shapes and see if that could help. Here you see my start with the big negative shapes. I wish I could say I was doing this blind, but I wasn't. For whatever reason, my hand/eye coordination was off this day! But I kept going, trying to use color to mark out the spaces around the lips and eyes. It led to an interesting and lively--if not entirely accurate--result. But actually, I kind of like this sketch. There's a fierce energy to it. I decided to try a different coyote model for my next sketches. Still using watercolors, I picked one I could draw straight on. Below you see the sketch in front of the model, and then a clearer scan of just the sketch. As you can see, I continue to struggle to capture the perspective of a nose pointed toward me! I very much enjoyed feeling my way around the subject with my brush and colors. For my final sketch of the day, I kept the same model, but took a giant step to the right, just changing the angle that much. And I switched up my media. I wanted to keep with watercolor tools, so I used just one watercolor pencil, and did a monochrome scribble. Because by this time (a good forty-five minutes into my session) I was well and truly warmed up and familiar with my subject, this sketch happened very quickly. I felt confident and loose. When I went back over the sketch with a waterbrush for shading, I felt like I knew exactly what to do. This reminds me a bit of my earlier work with the skeleton model. It took me several drawings of the same subject (two different models of coyote) to get enough familiarity with the animal to begin to think more about what I might do with it. If you can find taxidermy in your area, I recommend scribbling sessions! No matter the media, you can have a lot of fun and learn a lot by drawing the same animal model. All you need to do is change your angle slightly and you have a new drawing challenge! More working big in my July watercolor class--I decided to tackle an underwater subject and work from a photograph. Both of these are things I have very little experience with. I chose a photo I took while snorkeling in the U.S Virgin Islands a few years ago. Since I love snorkeling and underwater photography, I have literally thousands of wonderful photos I could work with, if I could develop my skills at painting from photos. It's not as easy as it seems. You can see here from the picture of my workspace in the art studio that I worked pretty simply. An ipad (for a large version of the photo), two water containers, a 1.5 inch flat for the entire painting, my small palette with eighteen or so colors, and my paint box, with the same colors, so I could get more paint for bigger areas if I needed it. One of the big challenges for me was to continue to focus on shapes and volume. So I decided to use only that big wash brush for this painting and see how I could do. Pretty well, actually! It kept me more loose, kept my arm moving from the shoulder, and I think resulted in more expressive work with the paint and the animal. This took me remarkably little time--maybe about a total of 30 minutes of painting time, not counting the time it took for each layer of paint/water to dry. Overall, it took me closer to two hours, but I spent the dry time on this painting working on other things in my sketchbook. I am not entirely sure what I think of the background hues, but I am quite pleased with the fish and the angle. However, I could tear the piece up and never see it again and the time spent would be well worth it! I so enjoyed focusing on just this one photograph and just this one animal. During the entire painting process, I felt transported back to the sea, floating in the warm water, watching the astonishing and busy life that occurs just off shore and out of my "normal" landlocked sight. Snorkeling is my most favorite thing to do (and I sure wish I could find a cheap way to do it, so I could do it more often! ), and to use my art to bring it back to life is just bonus. As part of my July watercolor class, I had the wonderful experience of working with a skeleton for the first time. He or she (no one in the class knew or could tell) could be posed, so the instructor had him/her sitting in a chair up on a riser so that the ribs were about even with my head. That led to the interesting angle of having to draw the skull from below. Since the subject felt so complicated and strange, I added a bit of comfort to my experience by drawing contours first with a Pentel Pocket Brush pen. The upper scribble here resulted from my first attempt. The lower was my second. You can see that in the first one I attempted to show some shading with the brush pen but it wasn't working for me that day. I didn't have the patience. So I mixed a lovely gray watercolor and went in with that. Much better. Also, I enjoyed seeing how much the second attempt improved! A reminder that whenever learning a new skill, I shouldn't judge myself on a first attempt. Or probably any single attempt, as a bad day, or a bad drawing, can happen at any time! You would think at fifty-three years of age I'd have learned this by now. I know that it is true. But why do I need constant reminders? Anyhow, I tackled it again with a dip pen and some purple ink, just to see how I could do with the shading, now that I felt a bit more comfortable with the subject. I tried it again a few days later, with some new Daniel Smith sepia watercolor. My goals here were to test out the new color as a monochrome paint, work with the skeleton some more, try out some new rough surface watercolor paper I had purchased, and attempt to draw shapes instead of contours. I did three drawings on one piece of the paper. You could probably guess that the upper left came first, then the upper right, then the lower sketch. Each one gets better with the structure and the shadow shapes. I really like this page, this set of sketches, because it shows the progress that can be made in just one hour (or so) of trying, then trying again, then trying again. I think I might frame it just to use it as an example for my creative writing students. Next session, I decided to try the sepia paint (which I completely love for monochrome work!!) and do a "heroic" study--a painting of the skull bigger than life. Again, I wanted to try to represent shadow shapes and volume instead of starting with contours (like I do when I sketch with pen). This is on 18 x 24 Strathmore 400 watercolor paper. I am super pleased with the results of this. My last work with the skeleton is a piece that took me several days. I took a photo of him/her sitting in the chair in the art studio. The walls behind are gridded with artwork by former students. I wanted to play with color and big shapes and aim for a sketchy, scribbly feel and just see what happened. This is on 22 x 30 rough paper. Okay, that was a lot of fun! And super hard. The ribs and the grid on the wall came pretty easily, mirroring each other, I thought. But holy cow I couldn't render the skull to my satisfaction. Not nearly as well as I had in earlier sketches. Like I said, no matter where you are in the process, there's always the bad day or the bad drawing. So, while parts of this piece are overworked (because, frankly, I just wiped down and started again on that skull, knowing it would end up murky, but attempting to learn something from the practice), I like the colors and lines and general composition. And I really like the idea. I may try to do it again some time in the future. I wonder if I can gain access to this or another skeleton if I'm not in a class? I have to investigate that. If you've never drawn from a skeleton, or even just a skull, I recommend it. The subtleties amazed me! And once again, scribbling has led me to a new appreciation of all the beauty that is around--and within--us! 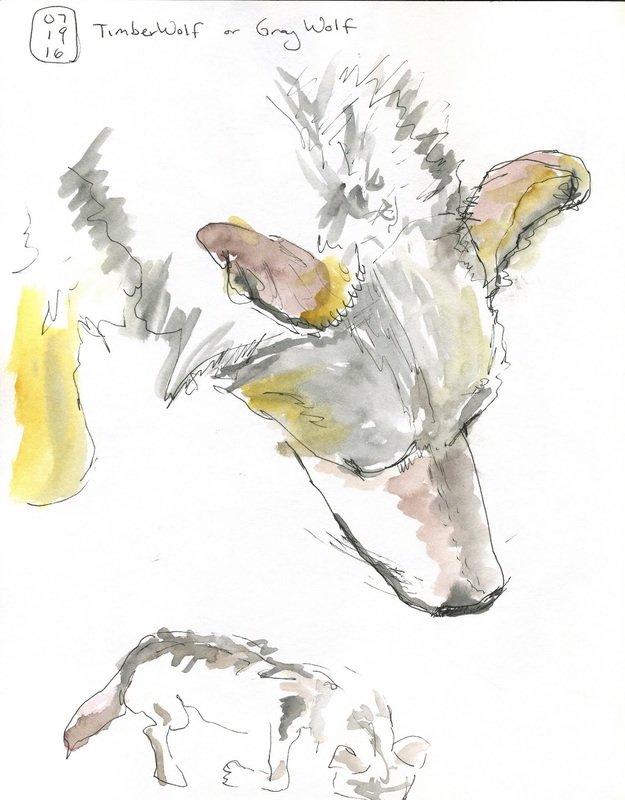 As part of my July "Going Big" watercolor class, I decided to try a portrait of my Dutch Shepherd, Nikolaas. I sketch him all the time, as you've seen if you read this blog, so I am familiar with the subject! However, in this case, instead of working from life, I worked from a photo. This is on 18 x 24 Strathmore 400 watercolor paper, with Daniel Smith paints. First I sketched the main shapes in lightly with pencil. Then I washed in the spots of quinacridone gold. While that was still wet, I started the blue wash, because I wanted the colors to blend at the edges. Still, I wound up with many harder edges than I had anticipated. Probably I didn't soak the paper adequately before I started! Live and learn! Because of the strong cast of sunlight on the right and the strong shadow on the left, I planned from the start to only detail one of his eyes. However, I couldn't get it placed right, not in the initial drawing or the initial washes. I measured and measured, but it just didn't come out right. I did this working in a tiny space, actually. Just a portion of the table at my friends' house during our weekly Open Studio. Best part of my week. After I got home and things dried completely, I went back in with some glazing to darken the darks and warm up some of the gold. I think I only used four colors in this work--quin gold, indanthrone blue, burnt sienna, and a second blue--maybe phthalo?--for his bright blue tag (and a bit of variation in the lake. After spending so much time working with the flat photograph (which I think probably was what stymied me about the placement of that eye), I grabbed my trusty brush pen and journal and went outside to scribble Nik from life, while he played with his ball on a hot day. I want to bring some of this scribbly liveliness into my bigger work! !